Organizing your information into a syllabus is an effective way to provide course materials for students. You can incorporate everything from basic black and white copies to full-color to custom designed index tabs and binders. You have enough things to worry about getting ready for class. 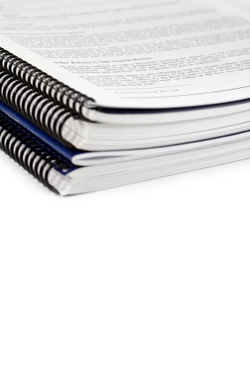 Printing, collating and binding your syllabi and lab manuals shouldn’t be on your to-do list. Our quality assurance process ensures accurate reproduction of your course material. Our diverse finishing services will ensure your project is easy for students to work with. We guarantee you syllabus is delivered on time—every time, without fail. And you won’t get excuses from us! Be sure to ask us about our exclusive Syllabus Guarantee.